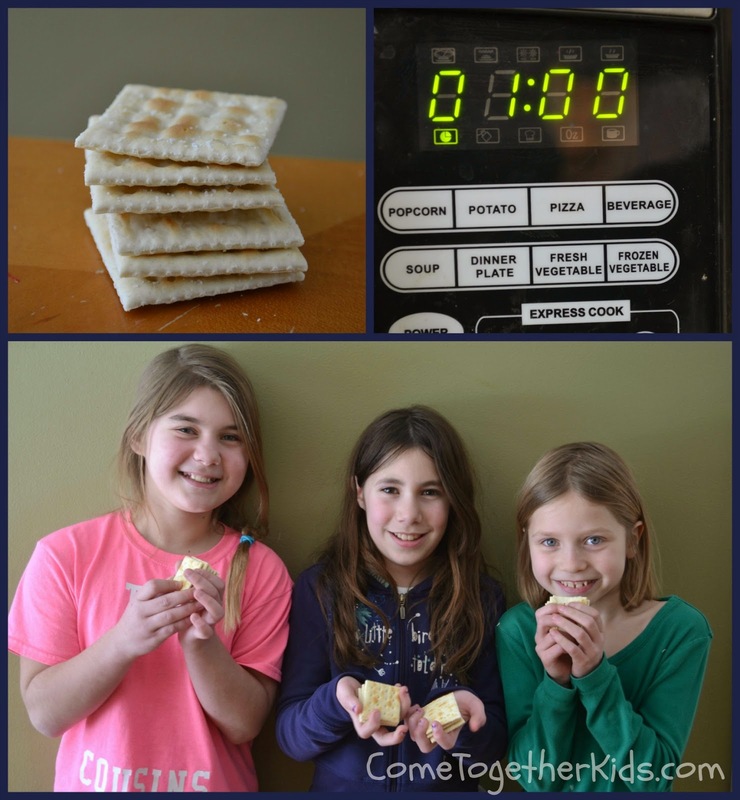 Saltine Challenge: Can you eat 6 saltines in a minute? Desperate times call for desperate measures. We've had an overabundance of snow days this winter and the kids are actually getting tired of all the days off school. When they don't want to play outside anymore and cabin fever is setting in, I've had to reach deep into my bag of tricks to keep us all sane and entertained. This trick was from way back in my college days. My friends and I learned about it somehow, then challenged people every chance we got. In all the times we presented the challenge, we never had anyone who was able to do it (and we won tons of free meals and free drinks in the process!). You most likely have the supplies on hand, a box of saltine crackers (salted, not unsalted), a timer, and some willing participants. 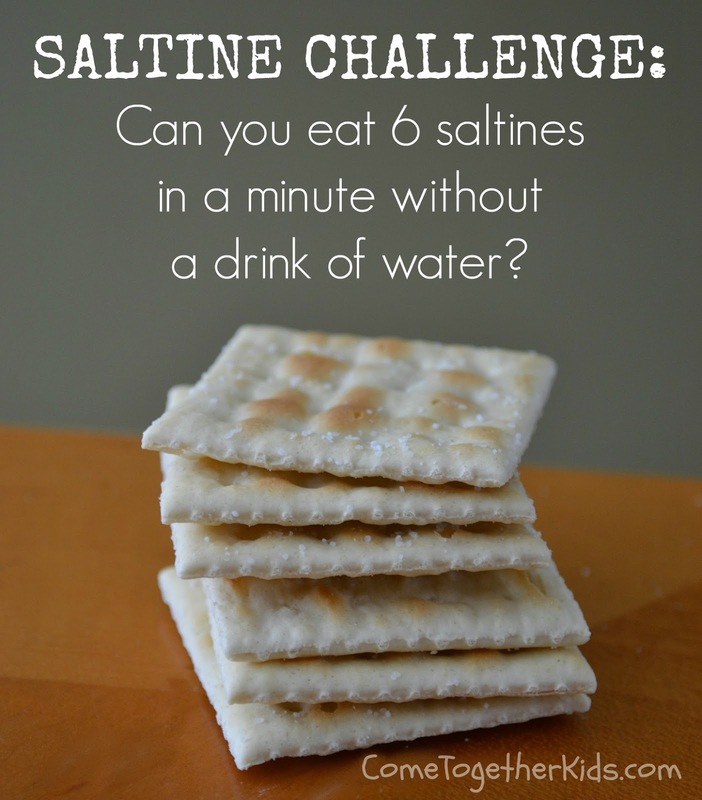 The challenge is simple... all you have to do is eat (and swallow) the six saltines before the minute timer goes off without getting a drink of water. You can eat them one at a time, two at a time, or even all six at once. It sounds easy and you might be feeling pretty confident after the first one or two. However, you'll soon find that the salt produces extra saliva but then the dry crackers quickly absorb any and all moisture in your mouth. By the time you get to the last cracker or two, you'll be laughing and crumbs will be flying everywhere. We did have to run the vacuum to sweep up some crumbs, but it was a fun little break and brought lots of laughter and giggles. I love seeing my kids grow and become more independent in the kitchen. It's my hope that by the time they move out of my house, they're able to follow a simple recipe and be confident enough to make a decent variety of basic meals. 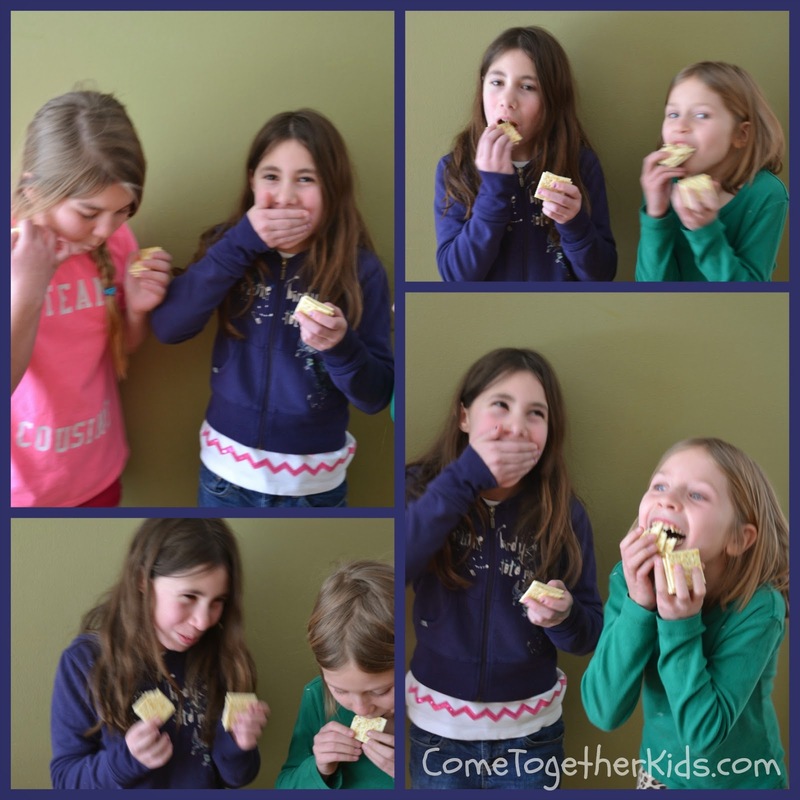 Over the past few years, my girls especially have had a lot of fun using the stove and oven with some supervision and are now pretty adept at making their own cupcakes or simple pasta side dish. (Now I just have to keep working on my son!). 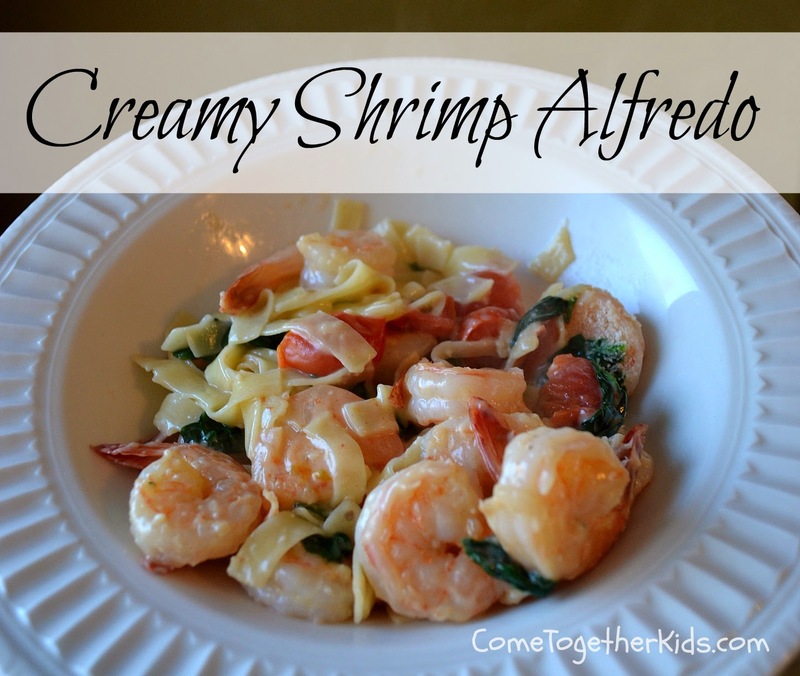 This Creamy Shrimp Alfredo dish was a great way to get them to expand their skills a little bit and make a yummy main dish for our dinner the other night. 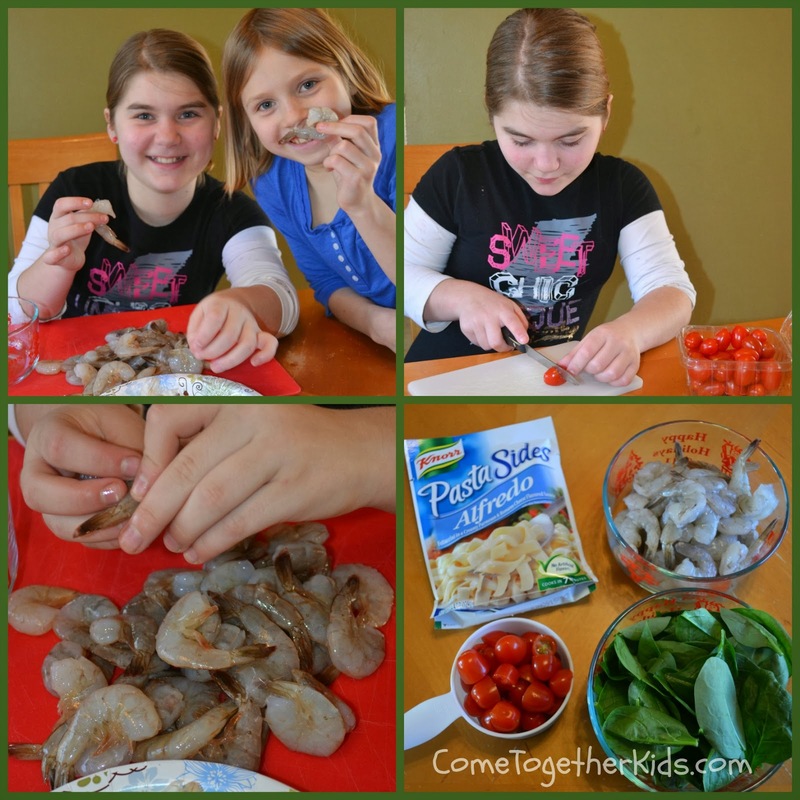 The recipe starts with a packaged pasta side dish that they're used to making, but adds shrimp, tomatoes and spinach to make it a full meal. The prep was really simple, just peel the raw shrimp and half the cherry tomatoes. Next, they headed to the stove. Simply cook the Alfredo pasta according to the package directions and stir in the tomatoes and spinach during the last five minutes of cooking time. Meanwhile, in another pan, heat the oil and cook the shrimp for about 5 minutes until pink, stirring occasionally. That's it, once the pasta is tender and the shrimp are cooked, simply stir the shrimp into the pasta mixture, add a little parmesan cheese and serve. 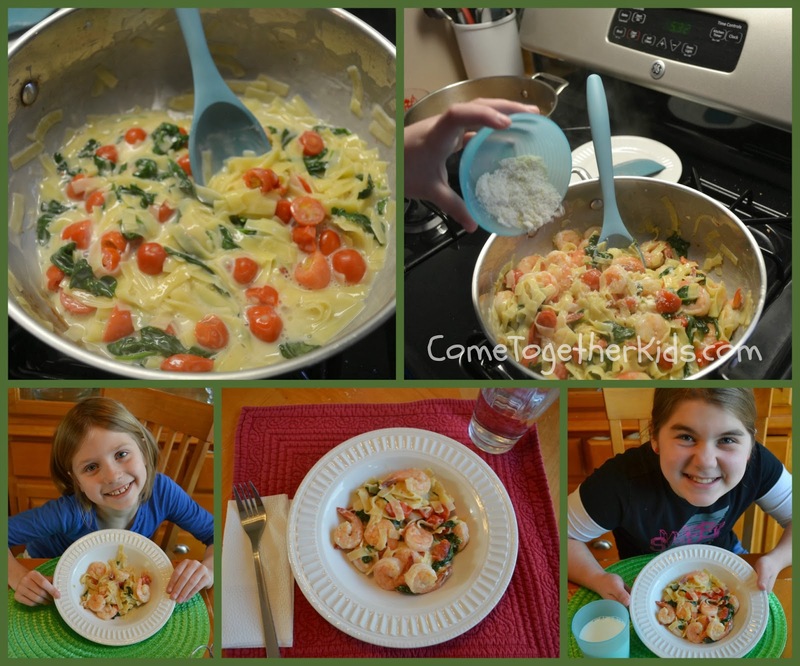 This new recipe was a delicious meal on our busy weekday night yet was easy enough that even my 8 and 11-year olds could make it with just a little supervision. 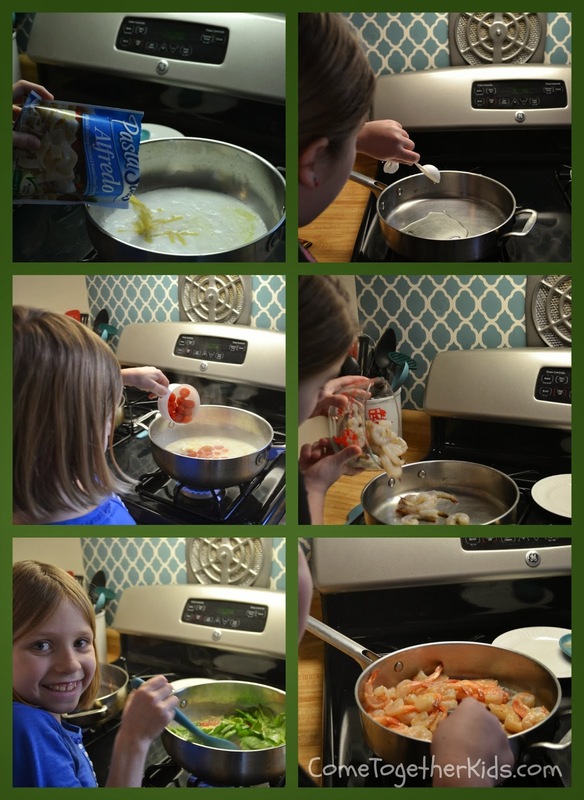 You can find the Knorr Pasta Sides at Giant Eagle and they even have a Free Recipe Book with this recipe and several others to help kids (and adults) make simple yet tasty main dishes.